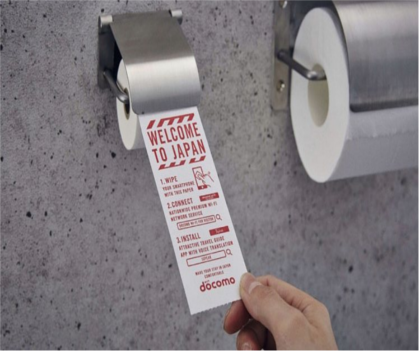 Japan has taken its reputation for hygiene up another notch with the introduction of “toilet paper” for smartphones inside toilets at Narita international airport. In a new take on the meaning of public convenience, users are invited to pull off a piece of paper from a dispenser next to the regular toilet roll and give their phone screens a germ-busting polish. The smartphone sheets, which bear the message “welcome to Japan”, were installed in 86 cubicles at Narita’s arrivals hall this month, according to the Mainichi Shimbun. The telecoms company behind the service, NTT Docomo, said the option of an extra wipe would remain until next March. The introduction of the cleaning paper came in response to studies showing that smartphone screens typically house more germs than toilet seats. Surveys show that foreign visitors are universally impressed with the cleanliness and versatility of Japan’s public toilets. Toilets are serious business in Japan, where many public buildings are fitted with hi-tech washlets with heated seats and jets of warm water and air that the late restaurant critic AA Gill described as “strangely addictive”. In some women’s public lavatories, users can call on assistance from the sound princess – a gadget that produces loud flushing sounds on demand to cover up any embarrassing noises associated with answering the call of nature. Japan’s newest toilet models have a deodorising function that, it is claimed, can quickly eliminate unpleasant smells, and “intelligent” seats and lids that rise automatically depending on whether a male user is about to urinate standing up or settle in for a longer stay. Incoming passengers at Narita are encouraged to read their smartphone sheets before they flush them away for details of Wi-Fi spots and other travel information, according to the Mainichi.